If you also believe that a good day begins with a good morning, we invite you to enjoy our rich and genuine breakfast, one of our stongest points. An awakening of mind and body thanks to our breakfast, from traditional homemade pastries, fresh fruit, cold cuts and cheese, everything of high quality. The vegetables and fruits are selected personally by Mr. Antonio: You will find on our tables fresh, local products, chosen daily from trusted greengrocers. Different fruits and vegetables are grown in garden of the house by himself and although not possessing organic label, because not intended for sale but only to the consumption of the hotel, we can ensure the authenticity, including cold pressed extra virgin olive oil produced without any pesticide. And then the jams of oranges DOP of the Gargano, annurche of apples, plums, figs and apricots that Mrs. Antonietta prepares during the year. Last but not least, the homemade cakes from Mrs. Maria, by now specialized in “diet” sweets privileging always the extra virgin olive oil instaed of butter and wisely dosing the quantities of sugar. The lunch after breakfast is rarely requested by our guests; if you wish to relax at our pool or in our new wellness area, you can have a light lunch with dishes based on fresh products such as salads, mozzarella cheese, cold cuts and fruit. All this means that our culinary art is genuine and tasty as well as light in the tradition of Mediterranean cuisine. 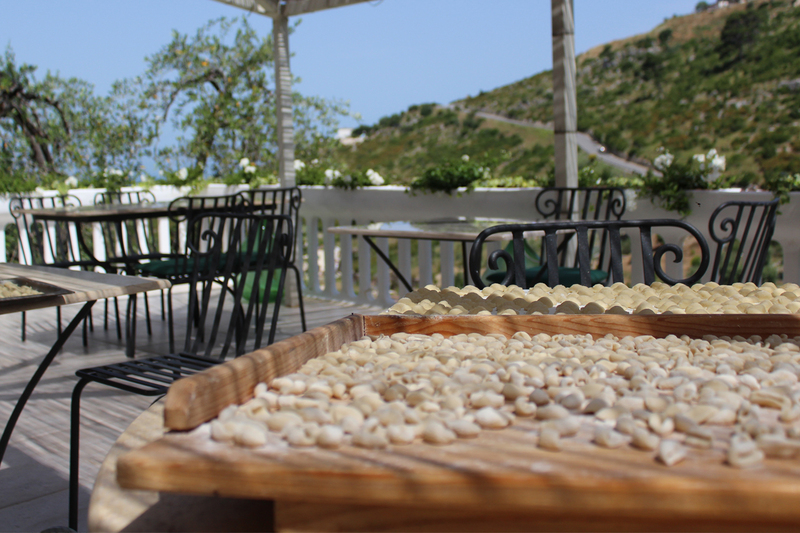 Be inspired by the skilful art of Mrs Antonietta: you can watch her preparing the traditional durum wheat pasta like orecchiette and maccaroni, typical of our region to be enjoyed during our tasting dinners. We offer a bar and light petit restaurant with local fresh products km 0 and Italian kitchen ( spaghetti with tomato sauce, pesto sauce, aubergine parmigiana, different types of salad, caprese, typical cheeses, chicken cutlets, grilled vegetables, steamed vegetables, vegetable extracts and fruit salads and so on). We are mostly looking for organic products. This service is available from 1:3pm to 9:0 pm. With this service we hope to satisfy the needs of people who prefer a light and healthy cuisine, not forgetting the local products and the combinations between food and wine. At dinner time ( 7:00pm -9:00 pm) day by day we’ll write on the blackboard a first course and a second course, based on traditional recipes and fish. Our sommelier will describe the dishes and local wines that will be suggested to them. Dinner € 18 per person 2 courses (first and second). The Locanda does a meticulous search of the cellars of the territory and the excellence of the Land of Puglia. Therefore, ideal food-wine combinations of the territory or cocktails will be proposed. Marino, the sommelier of the house, will lead you on the path of the flavors of the Gargano, combining wines with every course or meal. It starts with a bubble (Charmat or classic method) which will be paired with an antipasto plate with typical products of the territory. Following a glass of white or rosé wine, and then a red that the sommelier Marino will recommend with the proposed food. The wines offered will be excellences of the territory of Puglia. There will also be news of local food and wine interest in English, German or French.